The Old Police Station in Tobago Street when this was taken is refurbished commercial units. 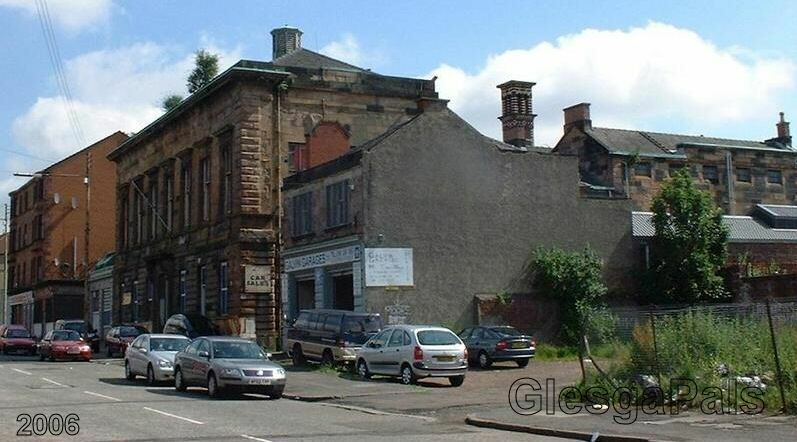 In my childhood I only managed a visit to this place once..........for playing fitba in the street. mayhem that was going on around this time, my old man wisnae to happy wi the polis! 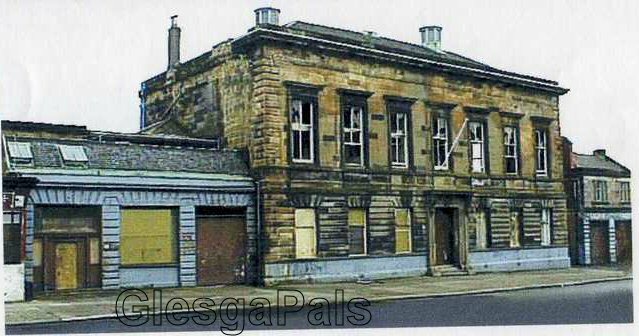 Dae ye remember when the coppers used tae walk frae Brigton Cross tae Springy Road testing the shop padlock were aw secured? Of coorse this was the days when bein a polis wis a serious profession an' no like these days when aw they day is drive roon smiling in a panda car that looks like a jeely piece. 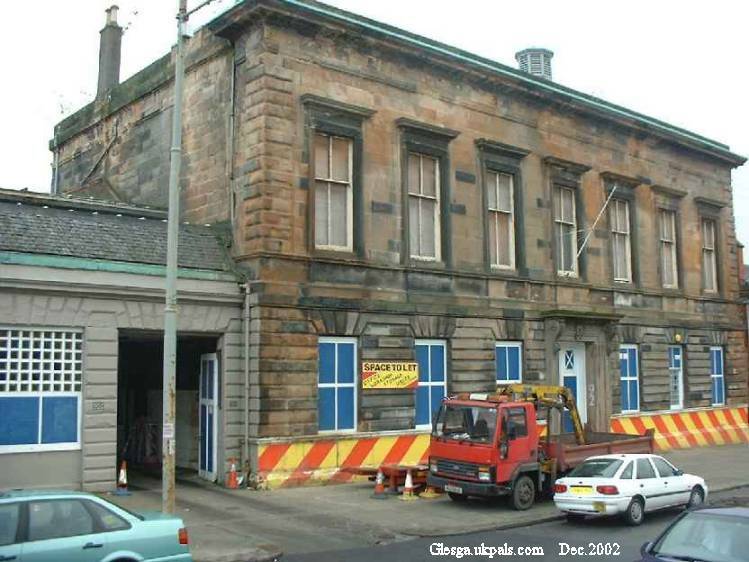 A' kin jist amagine the polis training school in they days:- "Constable Macdonald, how dae ye test a door padloke?" "Please sur... ye grasp it in yur right gloved hon an' shoogle it up an doon." " Correct constable, yer noo a fully fledged polis first class." "When the padlokes have been checked, look oot fur weans playin fitba in the street." ....... half of the East-end was slashing each other every night during the summer school holidays. What did Glesga's finest do...lift me and my pals for playing fitba' in the street.....the Untouchables..remember them and their two tone blue transit...lifted us for playing fitba' on the grass next to the Sauny pond on the Green. Result.....fined a £1 and warned as to our future behaviour.....we were 13! It was commonly known that the gentleman in question purchased 'excess' diesel/petrol from passing lorry drivers which he sold on again to other punters for a healthy profit. I remember quite clearly that it was not uncommon to have a black maria visit the premises with the sole purpose of purchasing up to sixty gallons of petrol/ diesel, and at one time (I promise this is true) there was on tow a senior officer of inspector rank, present with his nose firmly in the trough of illegality. Of course as a child none of this had an effect upon me as my only purpose was to bunch sticks and an honest wage. So whilst crime was rife throughout Glesga during this period, these same officers, who were up to no good themselves, would on back shift (and on good overtime) drive roon as the 'untouchables' picking up weans for playing fitba, and youths, (with nowhere to go) for 'loitering'. Aye, that wis the day's when the 'Bizzys' wur professionals, and ye could leave yer snek key on the latch, safe in the knowledge that you had the protection of the constabulary around you. Whits that I heard ye say 'some bliddy hopes'! "Ronnie as you know I also worked for the same firewood merchant when I was younger. I witnessed many of the tricks that Glasgow's Finest got up to as well. It wasn't uncommon for them to visit the scene of a crime during the night...usually a shop or a pub that had been broken in to... and take their own haul and take it to the firewood merchants and stash it in one of the lock ups....they had their own keys. When the merchant died you could not get near the chapel of rest at Daldowie for police...and I am talking anes wi' brading on their caps.!" 'charges' "I caught this hooligan stealing carrots My Lord!" "Stealing Cats?" says The Judge. "NO! stealing carrots!!!" "Oh! why did you steal a cat son??" "I didn't! I stole some carrots" "Were you hungry son?" "No, your honour, but my rabbits were!" "Officer!!" cried the Judge, "If you have nothing better to do with YOUR TIME! I certainly do! Why don't you go and catch some REAL CRIMINALS!!! Oh' I wiz chuffed! until I goat ootside' I still got a doing aff ma Da' even although I got off?? Life's no ferr sometimes, intitno?" "Although, the polis sometime have a difficult job especially when dealing with 'domestics'. I remember one night at the polis box at Kinloch Street (jist beside Celtic Park) this drunk guy wis gein his wife a real meltin, wae her face awe cut and screaming, he kept beltin intae her. Then oot o' the polis box comes pc 49 Murdoch wae his sidekick and began to grapple with the assailant, pulling him away from his loved one, at which she began to skelp away at the two coppers shouting 'you leave my fn man alane', which led to her also being arrested. " "Ronnie same thing happened to me and my mates one night when we were hanging about the Helenvale Flats. There is this guy battering lumps out of his wife on the London Road. Not wanting to get involved we stood back and watched from a distance one of the boys remarked " I wouldn't like to think it was my Ma getting a doing fae ma Da and nobody stepped in ". We walked over and started to tell the guy to stop it..next thing he lunges at us and we had to fend him off...next thing the wumman starts screaming about us trying to kill her man...before you know it people are shouting out their windows shouting at us for taking liberties...you cannot win in a situation like that....can you? "In all fairness Ronnie they weren't all bad. One night when I was about 16 about six us were walking by Capaldi's cafe in Springfield Road...the owner Big Tony was talking to two polis. I waved over to Tony as we made our way down to the Springfield lights...after about five minutes we made our way back up Springy Road. Next thing I know I am huckled up a close by two burly polis. My crime...I had gave them the Vicky...according to them I had when I had waved over to big Tony. The radioed for a van to lift me... next thing the van screeches up at the front of the close and out jumps a big Tuetcher Sergeant and my two law officers gave him a rundown of what I was suppossed to have done....meanwhile I am protesting my innocence. The big Tuechter asks me my name and where I lived to which I replied in my best voice " Charles McDonald Constable and I live in MacBeth Street". The big Sergeant then asks my father's name and where my family originally came from " I told him that my grandfather was a highlander but I was unaware where the family originally came from". He then spoke to the other two and they just walked away. The sergeant then turned around to me and said " Charles you have a fine highland name don't ever do anything to disgrace it so away you go and stop walking about the streets in a gang....get yerself a young woman if you want to stay out of trouble". "Charlie on the guest page mentions if anyone remembers 'Rubberlips' the polis, well I certainly do, and he wisnae wan o' yer wishy washy 'screws' who were never happier that when helping ye wae yer kerry oot oan tae the bus late on a Seturday night. Naw naw naw, Rubberlips wiz fur 'law an order' and pity any poor soul who crossed him by drinking frae a screwtap oan the bus efter time oan any night o' the week. It must be said that rubberlips (the scourge o' Barrowfield) wiz slightly psycho, bit fair wae it. If the polis on the beat in Brigton today were just hoff as dedicated tae law and order as rubberlips wiz, the neighbourhood would definitly be a better place tae live, and free of neds, nerdaewells, drugged up haulfwits crackpots, baw stoaters and balloons of every criminal persuasion. Come back Rubberlips, all is forgiven. "Ronnie,we are definatly talking about the same person and you described him brilliantly, I was only about seven year old in 1953 and I can remember my ma saying "if ye dont behave I,ll send for rubberlips"this had the desired effect and I was a good wee boy let me tell you.he was a b****** with a capital b. but at the same time two or three like him wouldnt go wrong today instead of these dikheads who spend their time hiding up back streets sleeping I' ve seen them when on nightshift and are never there when they are wanted.."
Well hing oan there a minute Hugh, whilst I know exactly where yer coming from, the fact is that railways were a very dangerous place for youngsters, as is the same today. So it might be the case that the polis (god bless them, lol) might have diverted your wee brother from a situation which could have put his life in danger. As previously mentioned, A polismans lot is not an 'appy one. Anywie's I was ge'in a caution and the inspector who gave me the formal lecture said to me that if I "Flew wae craws I wid be shot wae the craws", profound words which have stayed waw me ever since. I remember when I was about 13years old. Me and a few friends had been to the Kelvin Hall, the shows I think. Anyway there was a traffic policeman, stopping the traffic to let people cross the road. We crossed over and I threw an ice lolly paper on the ground, and to my horror, he blew his whistle, stopped the traffic and made me walk back into the middle of the road and pick it up. It taught me a lesson, and to this day, I've never dropped litter in the street. That's probably why my pockets are always full of rubbish. But I don't think it was a bad lesson to learn. Well..I hate to bring this up..but I, also, was taken to the Polis Station..but was allowed to leave and my two "pals" had to stay.. I wis just told to chose my friends, carefully.. I had gone to a big Department Store out the toon..it wasn`t Lewis` another at the top of a hill..always busy..sorry can`t remember the name. Just received my pay poke that Friday and had gone shopping on the Saturday with two friends (sisters) they left me and I bought, never forget, a lovely blouse, so I thought back then, and a nice wee pair o` black velvet flat shoes with the little bow in front..they left me in the store I bought my stuff met up with them , left the store and then we were surrounded..they had stolen clothes, as I was with them they thought that I wis also snatching merchandise..they found the slip that I bought mine...never went out with them again..a wis so embarrassed and scared oot o ma wits.